CLEVELAND (AP) — Francisco Lindor skipped down the third-base line, crossed home plate and suddenly couldn’t breathe. Lindor connected for a three-run homer with two outs in the ninth inning as the Cleveland Indians again moved 10 games ahead of Minnesota in the AL Central with a 5-2 win over the Twins on Wednesday night. Lindor, who struck out with the winning run at second base in the ninth to end a 3-2 loss on Tuesday, drove the first pitch from Trevor Hildenberger (2-3) over the wall in right to trigger a wild celebration. 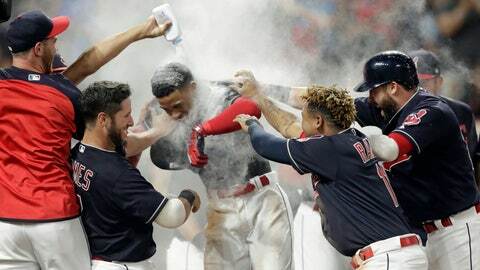 As the Progressive Field crowd roared as if it was October, the All-Star shortstop pointed and waved to the fans before being swarmed by his teammates, including pitcher Carlos Carrasco who emptied most of a bottle of white baby power on him. Down 2-1, Minnesota tied it in the ninth on Miguel Sano’s leadoff homer against Cody Allen (4-4), who cost Mike Clevinger a victory and wound up with a blown save and win. Jason Kipnis singled with one out in the ninth before Twins right fielder Max Kepler raced back and robbed Yan Gomes of extra bases with a leaping catch before crashing into the padded wall. Brandon Guyer followed with a single to bring up the electrifying Lindor, who has a knack for coming up big in clutch moments. “It’s like every time it’s a spot like this he’s always hitting when it’s a chance like this, and it’s like a sixth sense,” Clevinger said. Lindor’s homer was his 29th and gave him an MLB-leading 67 extra-base hits and 99 runs. Allen, the Indians’ dependable closer — and career saves leader — not only let the lead go, he cost Clevinger his first win since July 1. The right-hander limited the Twins to one run and five hits over seven strong innings, retiring the final 11 batters he faced before turning things over to Cleveland’s bullpen, which has been much better after some earlier struggles. However, Allen’s 2-1 knuckle curve didn’t fool Sano, as Minnesota’s cleanup hitter pounded his eighth homer over the wall. It was the ninth homer allowed by Allen in 47 1-3 innings — a concerning statistic for the Indians as the push toward the playoffs. Minnesota committed three errors in the first six innings. Cleveland has five players with at least 60 RBIs. No other team has more than three. The Twins aren’t strangers to late-inning pain, having lost 11 times on walk-offs. Minnesota may follow Tampa’s lead and use relief pitchers to open games before bringing in the scheduled starter. The Twins are intrigued by the method and have researched the experiment in the minor leagues. Molitor suggested the club could begin implementing it soon. The Indians officially released reliever Zach McAllister, who had been with the club since 2010. The 30-year-old was designated for assignment last week. McAllister struggled this season, going 1-2 with a 4.97 ERA in 41 appearances. Twins: Molitor still doesn’t know if LHP Adalberto Mejia will make his next start. Mejia pitched five shutout innings before leaving Tuesday’s win with a strained wrist. Mejia will throw a bullpen session on Friday. Indians: Guyer played center field for the first time since 2016 because Leonys Martin got “real sick” during the night, according to manager Terry Francona. Martin has played six games for Cleveland since being acquired in a deadline trade with Detroit. Indians ace Corey Kluber starts the finale of the four-game series against Twins RHP Jose Berrios. Kluber pitched a three-hitter and his seventh career complete-game shutout in his previous start on Aug. 3 against the Los Angeles Angels.